Today is officially the first day of Spring. 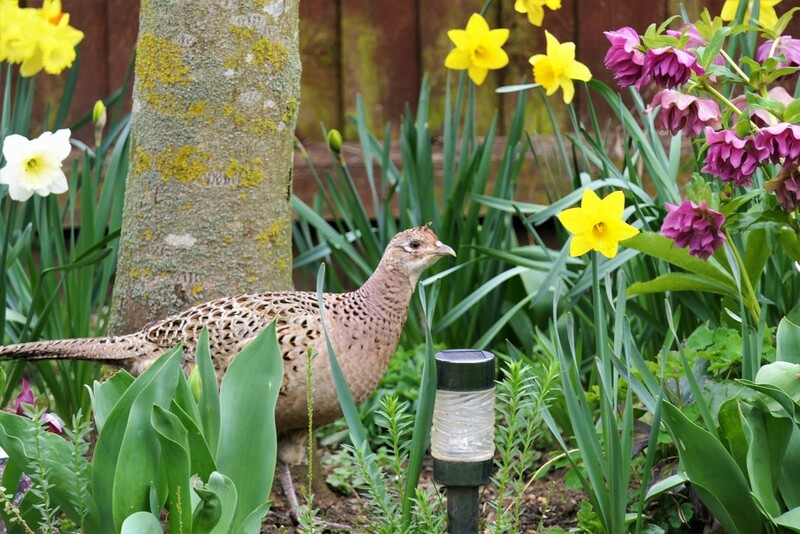 This lady visitor was strutting around the spring flowers in our garden. When I first saw this, it reminded me of a song that was around when I was young. Tiptoe Through the Tulips, as sung by Tiny Tim was released in 1968! I know these aren't tulips but that is how my mind worked today! Ahhhhh. The lady today. The other Sunday it was the male strutting his stuff around the garden. Love this capture with the flowers around. A lovely capture and yes I remember Tiny Tim singing Tiptoe through the tulips -- and your tulips are in bud ! A lovely capture. I think the ladies are very pretty. Don't I see Tulip leaves in the front there? Good shot- she's nicely framed by the other flowers. @olivetreeann yes they are, not out yet though. Great capture, but I've now got that song in my head too. Thanks!